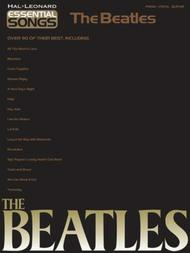 Essential Songs - The Beatles by The Beatles. For Piano/Vocal/Guitar. Piano/Vocal/Guitar Artist Songbook. Softcover. 402 pages. Published by Hal Leonard (HL.311389).ISBN 1423423895. 9x12 inches.Over 90 of the finest from throughout the illustrious career of this extraordinary band: All My Loving • Back in the U.S.S.R. • Because • Blackbird • Come Together • Day Tripper • Get Back • Help! • Hey Jude • If I Fell • Let It Be • Michelle • Penny Lane • Something • Twist and Shout • Yesterday • more!